One size does not fit all, so make sure you make the right choice for your customers. We began a discussion in the February issue on the interaction—or more accurately—the intersection of the pump performance curve (head-capacity curve) and the system head curve. Now we will graphically take a more in-depth look at how varying operating conditions and our resulting pump selections can lead to a successful installation or a source of frustration. As previously discussed, a system head curve is comprised of three head components: static head, pressure head, and friction head. These are shown in Figure 1. Static head (in blue) is the total lift or change in elevation from the surface of the water during operation (pumping water level when pumping from a well), plus any change in elevation between the pump discharge head and the irrigation system. 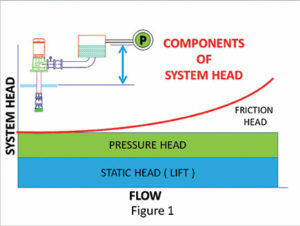 Pressure head (in green) is the system design pressure requirement. This is given in pounds per square inch (PSI) generally, but is easily converted to feet of head by multiplying by 2.31. Friction head (red line) varies with flow and is a function of the resistance in the piping system, including the size and length of the piping plus any valves, fittings, or other appurtenances. Once the system head curve has been established, a pump is selected that will match its head-capacity curve with the system curve at the desired flow rate. This intersection, when calculated correctly, occurs at what we call the design point. It is important to recognize the design point as the intersection of the two curves for several reasons. First, whether we realize it or not, there are always secondary operating points, even if only temporarily such as during startup and shutdown. Secondly, there are usually several different pump selections that will meet our design point requirement, but may present different problems when secondary operating constraints are considered. Pumps are designed to provide complete hydraulic coverage within certain physical sizes. Without getting too deeply into a discussion on pump design, suffice it to say that within a specific size, some pump designs will be engineered to produce high head/stage at a low flow, and other designs to produce high flows at a low head/stage. Between these two extremes a range of designs will provide a continuum of hydraulic coverage. These designs are defined numerically by their specific speed (NS), a dimensionless expression of the impeller’s geometry. Each of these designs has a characteristic pump head-capacity curve shape which rotates around the best efficiency point (BEP) of the curve. 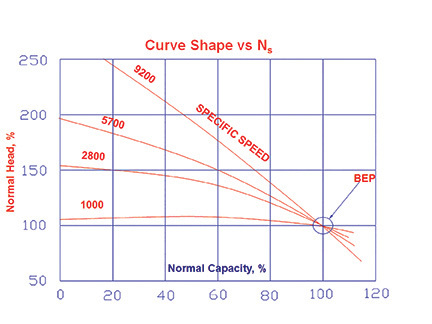 Pumps with higher specific speeds have steeper headcapacity curves, and pumps with lower specific speeds have flatter head-capacity curves (Figure 2). There are additional characteristics of curves with differing specific speed and they will be discussed in a future article. With the intersection of the two curves (design point) identified, conventional industry practices tend to focus on the lowest initial cost, followed closely by the highest efficiency offered at the design point. This results in a tendency to look for a selection that will meet the design point with the fewest number of stages. Low specific speed pump selections with their high head/stage offer this. The trade-off for this selection is its characteristically flat curve. Figure 3. 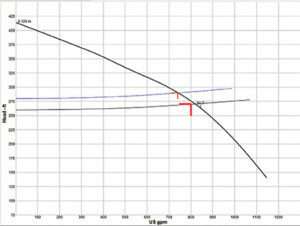 Blue system head curve line represents addition of 20 feet of drawdown. head/stage, it will meet the design point using only three stages. reduced to the point of being inoperable, particularly the end gun if equipped. 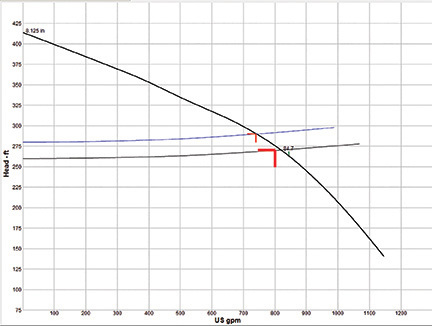 The pump curve selection in Figure 3 demonstrates the importance of another common industry practice: selecting a pump with a steep head-capacity curve. 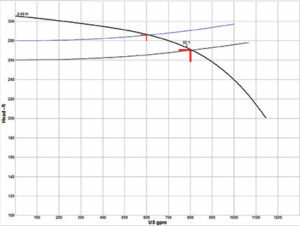 We see in many engineering specifications where not only is a steep curve required, it is mandated the design point must be to the right of the best efficiency point (BEP). This is because head-capacity curves are the steepest to the right of BEP. Our second example is shown in Figure 4 and features a pump with a specific speed (NS) of 2720. 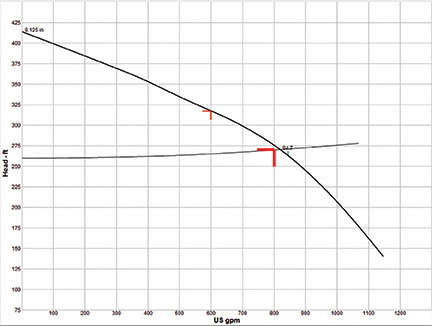 An identical system head curve is drawn (note the y-axis scale is different but the curve is the same) intersecting the head-capacity curve again at 800 GPM. The selection requires five stages since it is a higher specific speed and therefore will produce more flow, but at a lower head/stage. Figure 4. 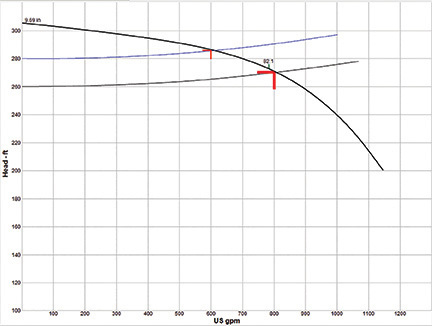 A five-stage selection where blue system head curve flow is better than 740 gpm. Here, when the secondary design point is taken into consideration (blue system head curve), the flow at desired pressure is better than 740 GPM. 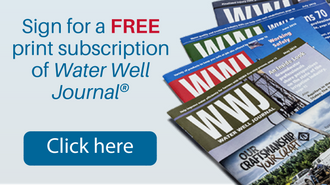 Sprinkler performance will be somewhat diminished, but the system will still operate. This makes the selection more expensive (five stages vs. three stages), but it will operate successfully across a broader set of conditions. 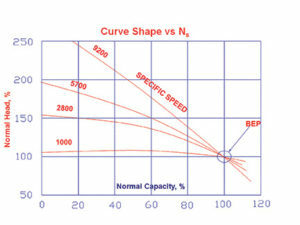 It is easy to see why it is generally viewed steep headcapacity curves are superior to flatter curves. There are exceptions to this, though. the pivot towers to fail. We’ve already seen in Figure 3 the pressure on our initial low specific speed pump go up only about 15 feet or 7 PSI at 600 GPM. This would be an acceptable increase in pressure. In Figure 5, though, we see when using our second pump with a specific speed (NS) of 2720, the pressure at 600 GPM goes up more than 47 feet (over 20 PSI). It’s additional pressure such as this, from using a pump with a steep head-capacity curve, causing boot failure. Figure 5. Pump with specific speed of 2720 and pressure at 600 gpm goes up more than 47 feet. Without knowing the specifics of the NRCS technician’s situation, my assumption is the pump system designer likely subscribed to the principle the steeper the head-capacity curve, the better. This designer either failed to understand the relationship between head-capacity curves and system head curves, or worse yet, simply failed to ask the appropriate questions to take secondary operating conditions into account. I think these examples show there is no one-size-fits-all approach to pump design. Each application requires us to ask probing questions so we can properly design the pumping system to meet our customer’s present and future needs. It is in asking these questions we truly become a resource, and not just a vendor or supplier. More information on DACUM and the charts are available at www.NGWA.org. 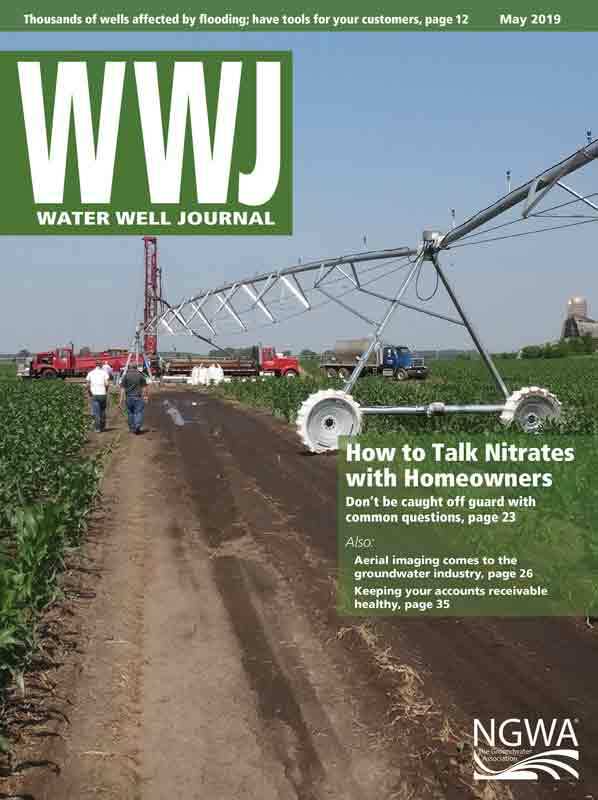 Mike Allen has worked extensively on water issues in Nebraska and was appointed by the governor to the Water Well Standards and Contractors Licensing Board in 1999 and served as chairman until 2013. 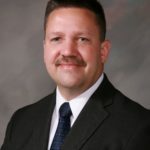 He also served two terms as a director on the Little Blue Natural Resources District Board of Directors and serves on the Board of Directors of the Nebraska Water Resources Association. 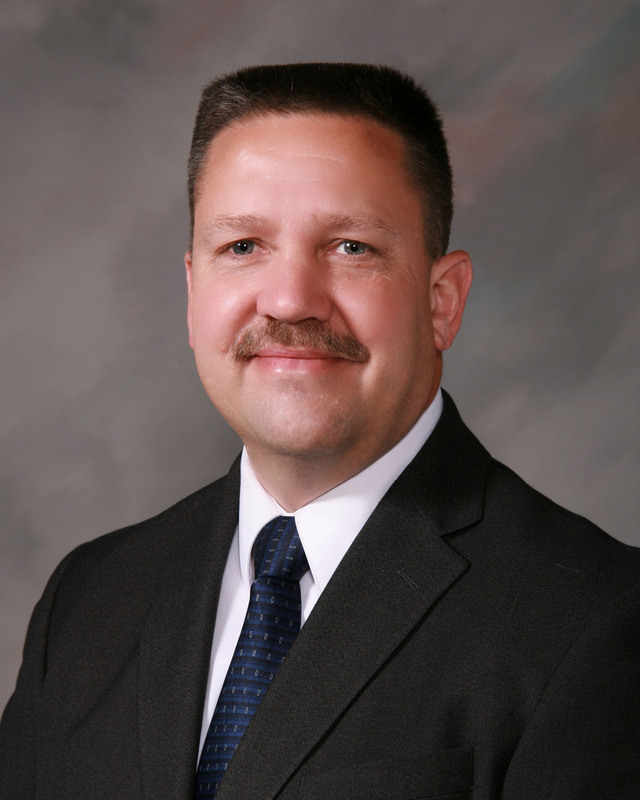 Allen currently serves on the Board of Trustees for Mary Lanning Memorial Healthcare in Hastings, Nebraska. He can be reached at michael.allen@marylanning.org.